Recently I was given a behind-the-scenes tour of Siemens Robotics Lab in Princeton, NJ where they demonstrated digital twin technology on a self-organizing manufacturing process. For those of you new to the concept, a digital twin is a virtual representation of a real-life physical product, building, or person. It can take the form of a chair, desk, lamp, house, or even your next-door neighbor. Any item that exists in the physical world can be replicated with a digital twin. 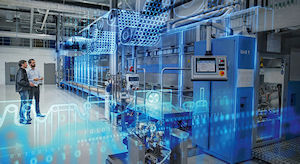 For anyone managing a business, digital twins offer unique insights into how products or processes are operating in real time, even from a remote location. Yes, the concept of digital twins has been around for a while, with consulting groups like Gartner hailing it as a game-changing trend, but businesses have been slow to embrace it because its rather complicated to implement. As an example, adding enough sensors to create a digital twin of a car will require not only digitally replicating the shape of the vehicle, but also the tires, seats, engine, and even mirrors. But things get far more complicated under the hood, where the inner workings of the engine will require a real-time simulation including every spark, explosion, and movement inside the cylinder block, pistons, crankshaft, valves, and plugs, capturing every distortion, wobble, glide pattern, and even the slightest bit of of friction happening in real time. However, this level of intricacy doesn’t happen instantly. As we step from detail and accuracy to micro-detail and micro-accuracy, these super elaborate 3D models will enable us to visualize how our physical products are performing and changing in the moment. If something breaks down, we can instantly tell what went wrong. More important, we can begin to anticipate failure and devise preventative maintenance strategies to circumvent disasters before they occur. Whenever I bring up the topic of digital twins in conversation, I usually get blank stares and quizzical looks. At this point the concept is not well known, yet over the coming years it will increasing become part of our daily lives. Even those with some understanding have a hard time grasping the ROI (return on investment) potential. But over the next decade, even the term “digital twin” will likely disappear as it becomes as common as GPS, Facetime, and Spotify. With the Internet of Things (IoT) entering our homes in new and usual ways, having a central command center becomes a logical extension of our need to monitor and manage our lifestyles. Security systems, cable TV, Wi-Fi, solar, water, sprinklers, and heating & air conditioning are typically disjointed components of a modern home. Over the coming decade most homeowners will migrate to a central command center that grows in capability over time. Digital twin technology will become an essential ingredient for our homes as they grow into the smart living organisms that are critical for managing the demands of the future. Siemens demonstrating the digital twin of a manufacturing process. Every ship, airplane, tractor, or turban in a power plant has the potential for being digitally replicated. The single biggest problem with digital twins is that one size does not fit all. In other words, a new digital twin is needed for every single product that is produced and the process that creates them. That’s because every product, no matter how precisely it’s made, operates differently. This is especially true if humans are involved in the production. Once we’re able to produce a virtual pairing with the physical world, we suddenly have the ability to analyze data streams and monitor systems so we can head off glitches before they occur, prevent interruptions, uncover new opportunities, and even test new strategies with quickly contrived digital models. Monitoring equipment in increasing levels of detail is just the first step towards redefining our new scope of capabilities. We will quickly move from “monitoring” to “control.” Over time things like “platooning,” “remote assist,” “remote operation,” and “emergency remote command” will become common phrases in our daily lexicon. Let’s start by using a trucking industry scenario. Platooning – The first phase of remote robotics for trucking will involve platooning where human drivers control the lead vehicle, followed by 2-3 slave (driverless) vehicles. Since the driver is still in control, additional support won’t be needed until it arrives at the delivery location where either addition human operators can take the controls or remote drivers can manage vehicles for the final positioning of the truck. Remote Assist – Similar to having a remote Uber driver “looking over the shoulder” of a driverless vehicle to assure it’s being operated smoothly. Remote Operation – The actual operators may be working in a cube-farm in Arizona or even another country, but having a person at the controls is critical for certain situations. Drivers, pilots, and captains do far more than just drive their vehicles. They provide a contact person to talk to, a sense of security, situational awareness, and the type of oversight and responsibility that only a human can provide. Emergency Remote Command – Since there is no such thing as an infallible machine, things will go wrong. When this happens, we will need a live person to manage the problem. The solution may be as simple as a system reboot, but in extreme cases, emergency rescue people will need to be involved, and having a central contact person to coordinate the response is critical. Smart cities will soon be managed through digital twin technology. Cities will soon have their own fleets of drones, with scanning capabilities, to create digital models of their communities. As scanners, sensors, and resolutions improve, cities will begin creating increasingly functional digital twins of their streets, neighborhoods, and activity centers. Having thousands of drones swarming over most metro areas on a daily basis may seem annoying at first, but the combination of new businesses, jobs, information, data analysis, new career paths, and revenue streams will quickly turn most naysayers into strong industry advocates. But for cities, digital twins will go much deeper than what’s viewable from above. This will mean digital twins of every power line, substation, sewage system, water line, emergency services system, Wi-Fi network, highway, security system, traffic control network, and much more. Done correctly, every problem will only be two clicks away from viewing on the digital twin master control center. In short order, digital twins of cities will become treasure troves of data as the daily inflow and outflow of people, traffic, and weather become far better understood. This form of digital modeling will also give rise to search engines for the physical world. In the future, drones and sensors will replace much of the work of today’s web crawlers when it comes to defining our searchable universe. Search technology will become far more sophisticated in the future. Soon we will be able to search on attributes like smells, tastes, harmonic vibration, textures, specific gravity, levels of reflectivity, and barometric pressures. Over time, search engines will have the capability of finding virtually anything in either the digital or physical world. How long before we can view a fully functional digital twin of our body? We already have several tools that can create a digital map of our body, both external and internal, like 3D laser scanners, radiography, echography, MRI, and more. We also have a growing number of wearables, along with both contact and embedded sensors that can track what is going on. In this context, I’m imagining a complete digital image of ourselves that can be rotated around, zoomed in for close-ups, watching blood flowing through veins and arteries, muscles flexing, heart pumping, food and water working its way through our digestive system, with increasing levels of detail possible for every gland, follicle, fat tissue, organ, and taste bud. When we finally develop holographic displays, our ability to gain relational perspectives, as well as cause and effect relationships will only increase. The human brain is still one of the most complex marvels of the universe, and creating a digital twin will require next-generation supercomputers and some amazing collaboration between brain researchers and computer engineers. To this end, Hewlett Packard is working with Switzerland’s Ecole Polytechnique Fédérale de Lausanne to launch the Blue Brain Project with the goal of building a digital model of the mammalian brain. Their goal is to develop a brain model that serves as the basis for an unlimited number of simulations and experiments. Experiments like this will not only require huge amounts of computing power, but also a massive range of computational approaches to simulate the brain’s unique techniques for organizing and interacting with it’s conscious and unconscious memories as well as functional responsibilities for managing the rest of the body. Rest assured, the creation of a “mirror brain” like this is still in the domain of science fiction, but nevertheless in the realm of next-decade possibilities. According to Siemens, digital twin simulations can even help determine the manufacturing process. To put things in perspective, the cars we drive today have been in development for over 120 years. It has taken that long to get to cars this good. With our emerging technology, we still have to work our way through the crappy stages before we get to the good stuff. At the same time, we are building a digital infrastructure that is layered over everything physical in the world. This is another form of digital twin thinking and eventually the two will align. Speeding this along, by 2022, 85% of all IoT platforms will include some kind of digital twin monitoring, and a few cities will take the lead in demonstrating the utility value of digital twin smart city technology. As I watched Siemens engineers at Princeton demonstrate different types of digital twin technology, it became very apparent to me that any company that lags behind in this technology will soon find themselves on the outside looking in.